Global Travel Media » Blog Archive » No Mutiny Here, Captain Bligh. For anyone who has ever visited the idyllic islands of Polynesia in the South Pacific, it’s not hard to see why the crew of HMS Bounty were reluctant to leave. Offered the chance to join Latitude 33’s 16-night The Brando, Black Pearls and Bora Bora journey, one suspects that even Captain Bligh himself might have been similarly swayed. The perfect blend of luxury and relaxation, with more than a hint of the romantic, this is the ultimate 21st century castaway experience. On 15 February 2021, just 20 guests will embark upon their exclusive South Pacific adventure. Topped and tailed by one and two nights respectively at Papeete’s award-winning Intercontinental Tahiti Spa and Resort, the itinerary takes in three nights at all-inclusive The Brando on the private island of Tetiaroa, once home to Marlon Brando and regarded as one of the world’s most luxurious resorts, followed by a 10-night cruise around French Polynesia on board Seven Seas Navigator. 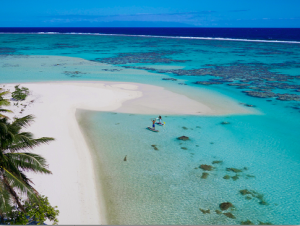 A tropical paradise, Bora Bora’s Tetiaroa is truly the island of childhood fantasies, replete with white sand beaches, exotic birds, swaying coconut palms and a sparkling lagoon. Guests at The Brando can choose simply to relax by the private pool at their luxurious beachfront villa, tempt their tastebuds at one of the resort’s three eateries or indulge in a treatment at the Varua Te Ora Polynesian Spa. For the more adventurous there’s an abundance of activities on offer from bicycling and paddle boarding to diving and snorkelling amongst a myriad of marine life including sea turtles and manta rays. Hard though it will be to bid The Brando farewell, 10 nights on board Seven Seas Navigator sailing Polynesia’s blue waters on a scenic discovery of its manyvolcanic islands and atolls strewn lazily across the grand Pacific Ocean, is the perfect antidote. The all-suite Seven Seas Navigator is described as 6-star cruising, and indeed it has few equals. Every suite boasts ocean views, most with private, furnished balconies, as well as an extraordinary crew to passenger ratio of 1 to 1.42, ensuring an exceptional level of service. Embarking 19 February 2021, cruise highlights include the spectacular bays of Moorea, said to be the inspiration for author James Michener’s mythical island of Bali Hai; West Polynesia’s Fakarava Atoll; the dramatic volcanic island of Nuku Hiva in the Marquesas Islands, home of the third biggest waterfall in the world; the coral atoll of Rangiroa in the Tuamotu Archipelago; Raiatea; Bora Bora; and the Society Islands. Guests can also make the most of a generous $500 shipboard credit per suite. 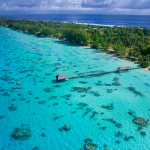 Disembarking in Papeete on 1 March 2021, guests will return to the Intercontinental Tahiti Resort & Spa for two nights and a last chance to soak up some South Pacific sunshine in a private overwater bungalow, before departing for their flight home. Departing on 15 February 2021, Latitude 33’s The Brando, Black Pearls and Bora Bora journey is limited to just 20 guests, with prices starting start from $21,299 per person twin share, including all accommodation, return airport transfers in Australia, return flights to The Brando, all meals and beverages at The Brando and on board Seven Seas Navigator, and all transfers and baggage handling throughout the tour.